Use this how many calories needed to lose weight calculator to determine a starting point for losing weight or gaining weight. Consume fewer calories than your average daily calorie needs, as this calculator gives, and you will lose weight. Consume more calories and you will gain weight. 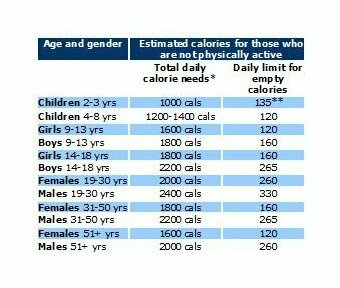 Some of you would rather see this information in chart form, so here is a chart showing how many calories an average person should consume if they are trying to maintain their weight. If you want to lose a pound a week, eat 500 fewer calories a day. If you want to lose two pounds a week, eat 1000 fewer calories. So, how many calories needed to lose weight? To lose a pound a week, see the third results in the table above. You will need to consume this many calories a day or less. To lose two pounds a week see the forth results. Eat this many calories a day or less and you should lose two pounds a week. Remember to bookmark this page, because as you lose weight you will need to eat less to continue to lose weight. Also remember to weigh yourself on a regular basis and to record this weight. When you begin to cheat, you will see the weight not being lost. There is another way to count calories. This method was made popular by Robert Pritikin. Check out this page on using the density of calories needed to lose weight.